SSD industry continues to see exceptional growth in virtually all segments. TRENDFOCUS has just released its latest NAND/SSD Quarterly update. In this latest report, covering CQ4 ’15 results and the updated long term forecast, all segments, both client and enterprise saw fantastic growth both in Q4 and in 2015 total. In the enterprise SSD market, all interfaces enjoyed double digit growth – SATA, SAS, and PCIe. Each interface is finding success in differing market segments. For SATA SSDs, hyperscale and cloud customers are the main driver for a sequential increase of 10.9% in CQ4 ’15. For SAS SSDs, although the unit volumes remain smaller than SATA volumes, the percentage increase reached 23.5% over the previous quarter. Finally, enterprise PCIe SSDs continue to struggle to find drastic increases in unit volumes, but from a percentage increase, it did see a 20.5% increase from CQ3 ’15. All segments should continue to see growth throughout 2016. Client Drive Form Factor (DFF) SSDs saw a slight increase of 4.5% growth vs. CQ3 ’15, while modules realized the largest growth of all segments, all form factors – both enterprise and client – with an increase of 25.7%. Client SSD sales in CQ4 ’15 were in stark contrast to the notebook PC market, as well as the 2.5” mobile HDD shipments – both segments seeing declines in unit shipments. This fact is an illustration of the consistently increasing attach rate for SSDs into notebook PCs. This aggressive trend will continue throughout the coming years, especially in the commercial PC sector. The NAND industry also saw another quarter of continued growth, with shipments rising 10% Q-Q. 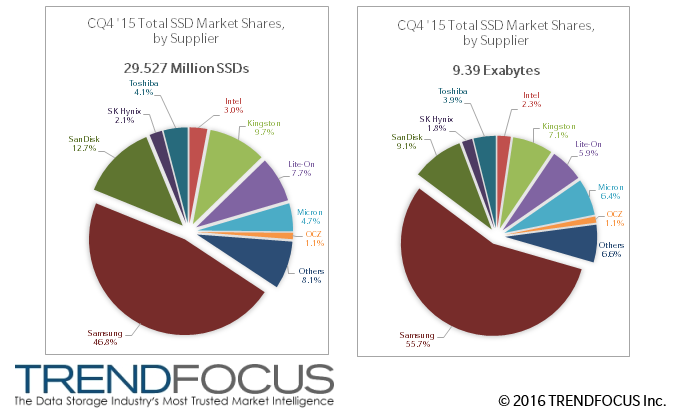 NAND shipping into SSDs continues to show strength, with over 36% of bits shipped going to SSDs in CQ4 ’15. Tablet, phones, and other applications consumed the other two thirds of the NAND output. With multiple vendors now moving to 3D NAND in the coming quarters, NAND shipments into SSDs will increase in capacity mix and bit absorption. For details in any of the market segments mentioned above, including HDD heads and media components, please contact TRENDFOCUS for more information. This entry was posted in TRENDFOCUS Blog and tagged NAND, SSD. Bookmark the permalink.